Spiderweb Turquoise is a term used to describe turquoise that looks like a spiderweb. It is not associated with any one mine, but many mines, some of the most notable being Kingman, Number 8, Lander Blue, Lone Mountain, Candelaria and others. 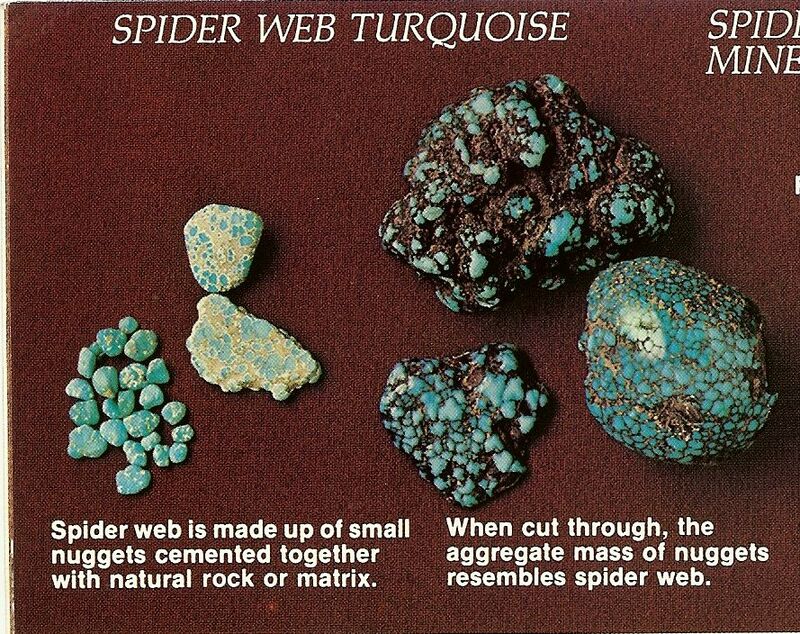 As described below from the book “Turquoise The Gem of the Centuries” by Oscar R. Branson, spiderweb turquoise can be thought of as small pieces of turquoise cemented together with the mother rock (matrix). 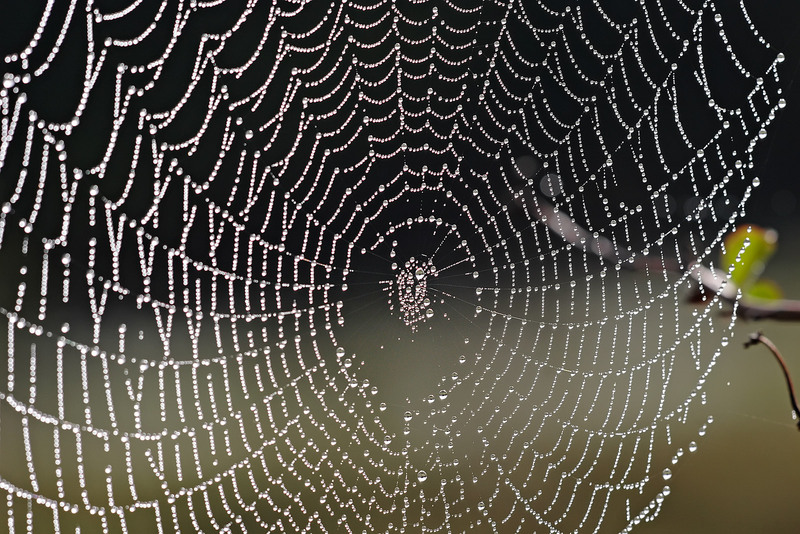 It is when these pieces are polished or cross cut that the spider web design emerges. 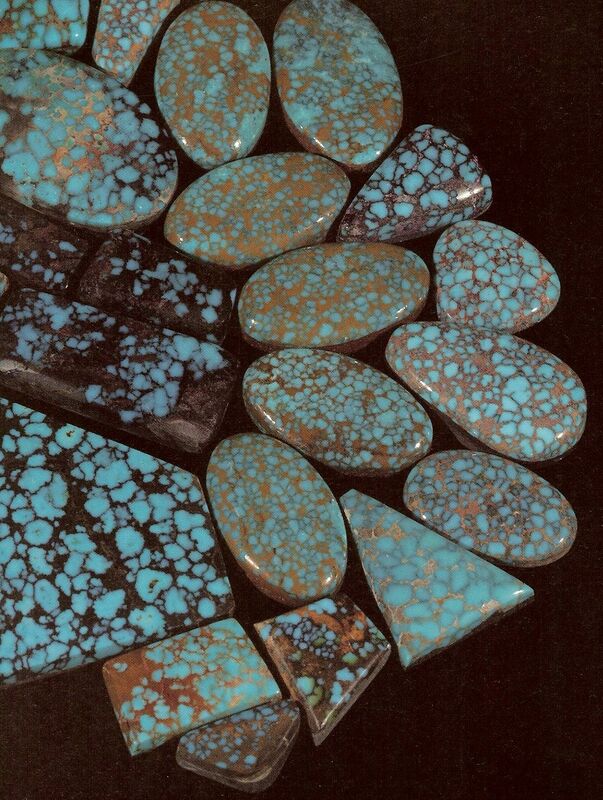 When other materials appear within turquoise, those materials which often look like veins, are referred to as matrix or part of the “mother rock”. Matrix can range in color from honey gold (rhyolite, a volcanic rock) or brown (iron oxide) to jet black (iron pyrite aka iron sulfide) and many other color variations. The matrix can be in large random blotches or it can appear as uniform lines around evenly spaced cubicles, almost pattern-like, which brings to mind a net or a spiderweb, thus the name. In some parts of the world, turquoise stones with matrix are considered imperfect and clear turquoise stones are most desired but in the US, spiderweb turquoise has much more appeal and value. I have three pendant necklaces from Peterson Johnson and am looking for a fourth one. I love his designs and the store I had purchased them from in Wilkes Barre, PA no longer sells them. I love the blue turquoise, or green stones if possible. Do you carry anything like this, or know where I could find one? We just got in a batch of beautiful stone pendants made by Peterson Johnson. You can see them all by visiting the Stone Pendant Page but here are a few samples. His work is exceptional and unmistakable. Peterson Johnson is a self-taught Navajo artist who has won numerous awards throughout the Southwest and whose work is sought by collectors around the world. He was born in 1956 and began creating silverwork in 1976. He is very well known for his traditional Navajo jewelry, which shows meticulous workmanship and has a distinctive Peterson flair. Peterson is known among fellow artists as “the machine” because he is SO meticulous in every detail of his work. The box clasps on his bracelet watches, for example, are finely tuned works of art. All of his jewelry is crafted with skill and precision to last a lifetime and be passed along to many generations. Peterson and his wife Alyce live in Gallup, New Mexico and travel to art fairs and pow wows year round throughout the USA displaying Peterson’s silver work and Alyce’s beadwork.